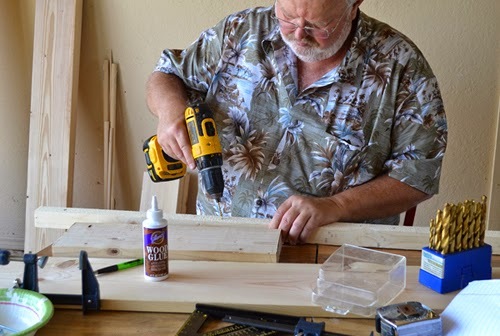 iLoveToCreate Blog: Make A Bed With Aleene's Wood Glue! 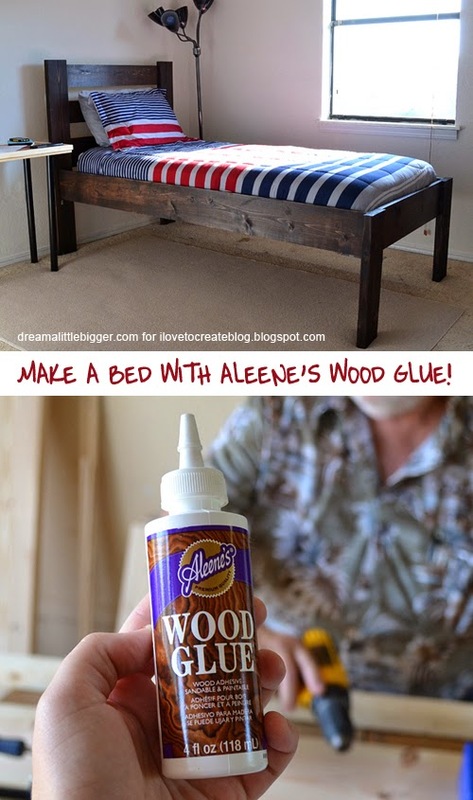 Make A Bed With Aleene's Wood Glue! My nephews are getting older and moving from a shared room to each having their own. 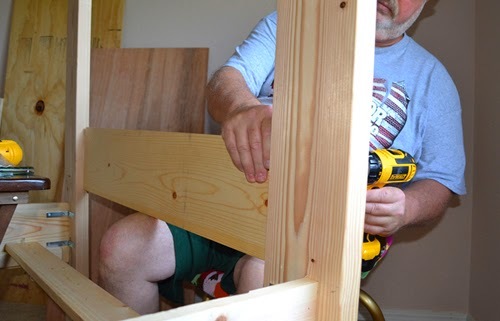 In an effort to help out with the transition and redecoration of two rooms, my dad and I decided to make each their own custom twin sized bed. 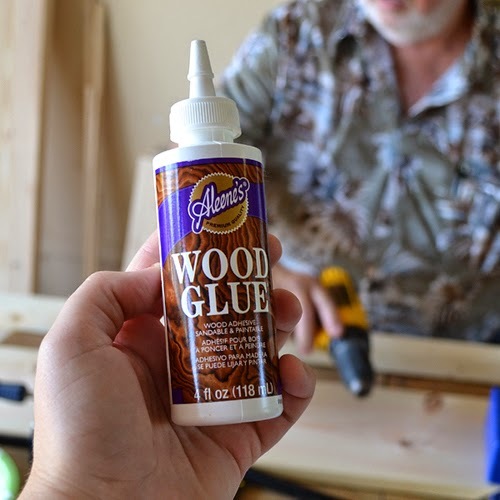 We enlisted Aleene's Wood Glue and got after it! We used pine but oak will make a finer finished product. 8' boards are easier to transport and will create less waste. Plus, the shorter boards can come from shorter trees and will cost you less. Just because that seems like kind of a daunting list, let's take one more peek at why you need all of that good stuff! 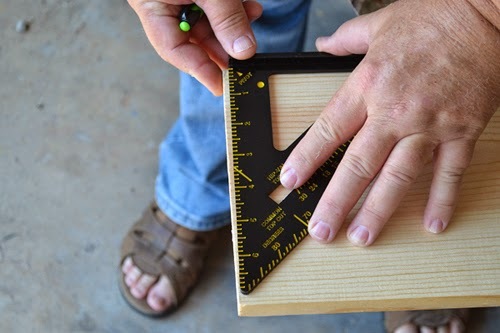 Measure and cut your boards according to the cut list. 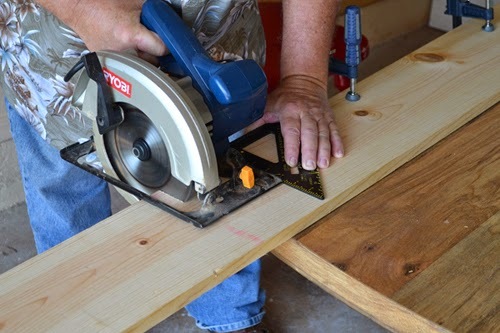 To get very straight cuts, use a speed square. A speed square is a piece of metal (or plastic but my dad swears those are junk) in a triangular shape. 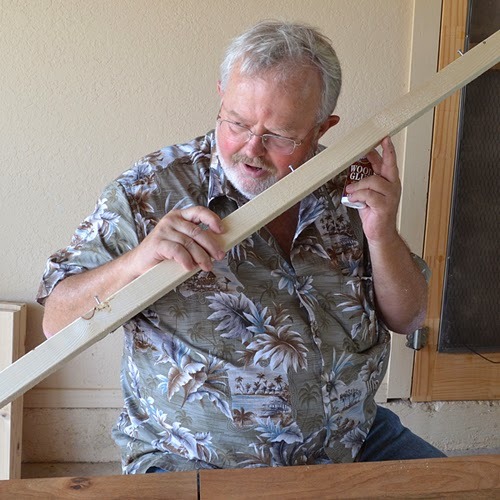 There is a lip that you use to hook onto the edge of the wood and hold it flush and "square". Following along the side, you'll get perfectly straight cuts. 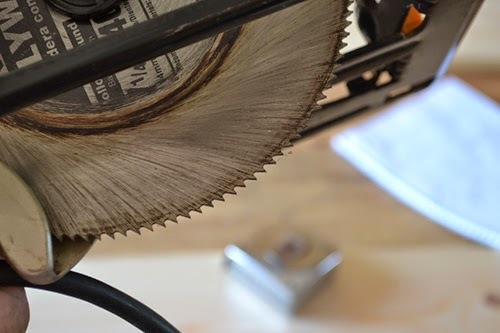 When cutting wood for a furniture project, you'll need to use a fine tooth blade. Blades with a larger teeth work fine for other projects, but will mangle our edges which doesn't look so hot for furniture. 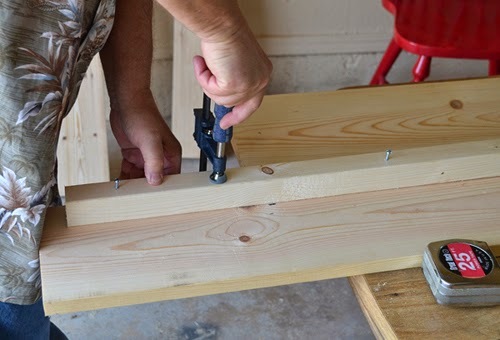 Pre-drill 5 holes equidistant apart down the length of your 2x2x70" slat supports. 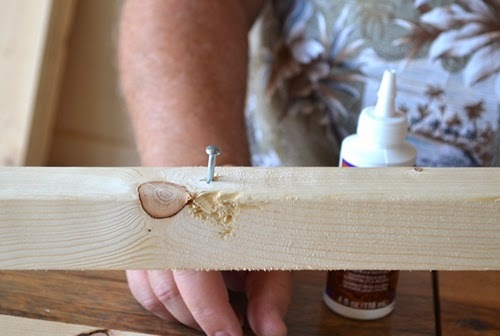 Start your 2" wood screws until they just peek out the other side of the wood. Next listen to your boards. What do they need? "Aleene's Wood Glue!" my Dad says. In other news, he's totally weird. But then again so am I. It must be genetic. 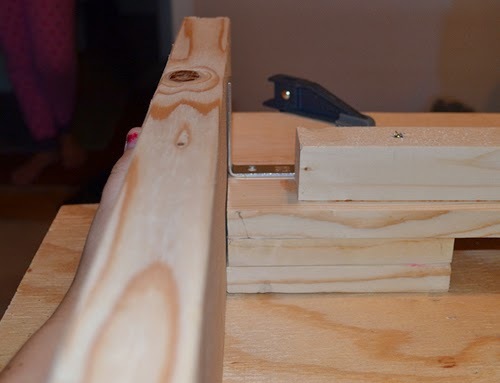 Taking your glue run a bead down the length of the inside of your 2x2x70" (not the side with the screw heads). Just a simple strip will do. No need to go nuts. Clamp the board together in place. 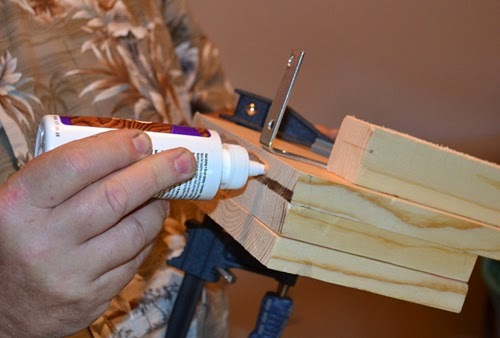 Clean the glue that squeezes out with a wet rag. Repeat for the second side and slat support. Next you'll attach your head and foot board legs to your side pieces. In order to be sure the side panels the same distance on both sides and ends we attached two pieces of scrap 2x8 boards to each end and held together with clamps. A tap of the hammer made sure that the wood was flush at the end. 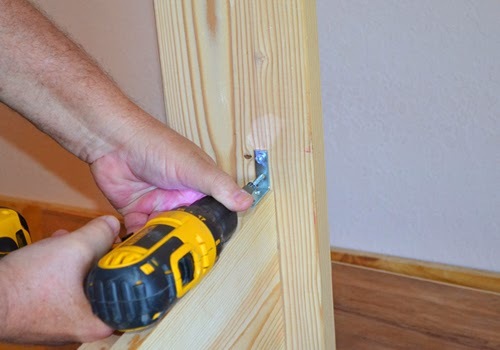 Screw 2, 2 inch angle bracket flush with the inside edge of the side pieces in with your 5/8 inch screws. 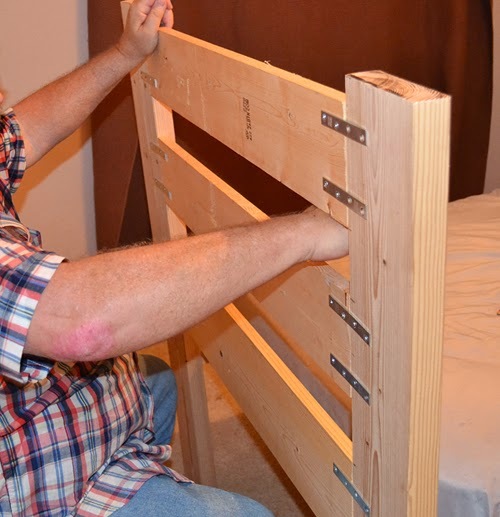 FYI - these brackets will connect with the headboard and footboard feet. 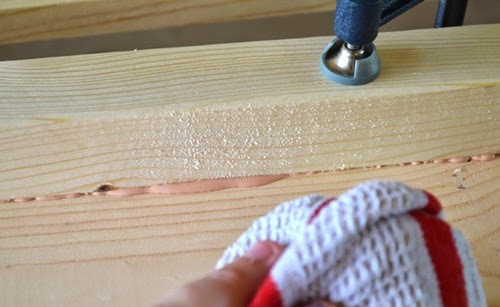 Apply wood glue to the the bed side only (not your scrap boards). 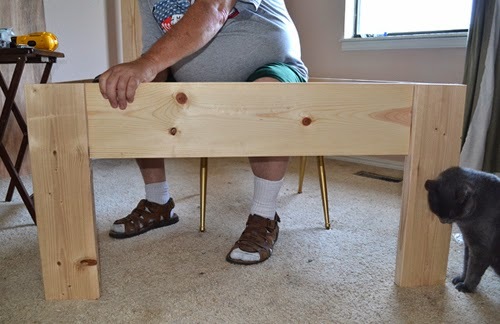 Hold 2x6x22" board flush with your bed side top as seen above so that it is even with the bed side. And secure with your 2" angle brackets and 5/8" screws. 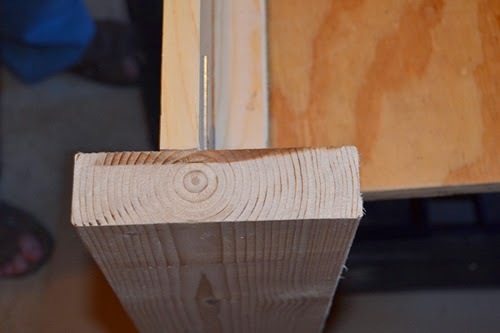 When you remove your scrap wood your foot and side will be connected like so. Repeat for the headboard foot on that side. Mirror what you have done for the other bed side and head and footboard feet. When done you'll have two pieces that look like this. 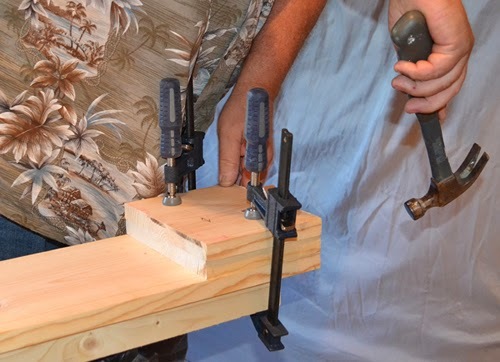 Using a slat board to help steady things attach two of your 4" mending plates with your 5/8" screws to the inside of both of your foot board feet. 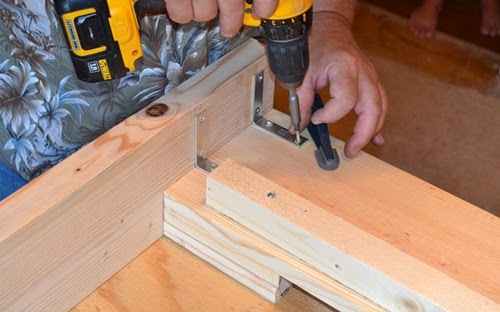 Making sure that the top stays flush with the feet tops, place one 2x8x34.5" board in between the legs and secure with your 5/8" screws. The crafty cat assistant breaking the bed in a little bit early is totally optional. Repeat for the headboard area. Although they're visible, we decided to add a little extra holding power to the bed with 1" angle brackets secured with 5/8" screws. 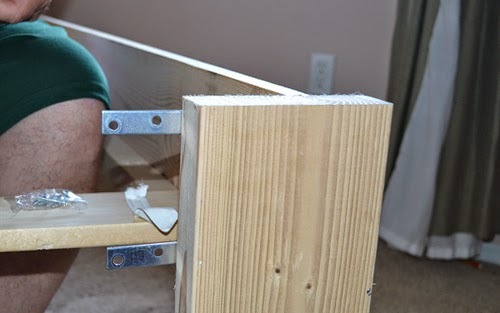 Take your last two boards, your 1x6x34.5" pieces and secure them equally distant apart from your headboard support. Secure with 4 - 4" mending plates per board. Because my hallway is crazy narrow we did the bulk of the work in the garage but then finished the bed inside of the guest room where I also stained it. 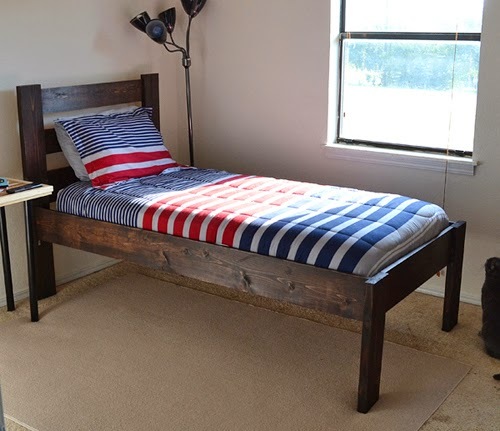 We went with a dark Kona color that just seemed very tween boy-like and found some All American red white and blue bedding to finish it up. And if you look closely, you'll see that super awesome yardstick homework desk we made a few months back, too! All in all the project took just about 8 hours including staining and can be made in a single day if you can set aside that much time in a row. We of course spaced it out over about 3 days! 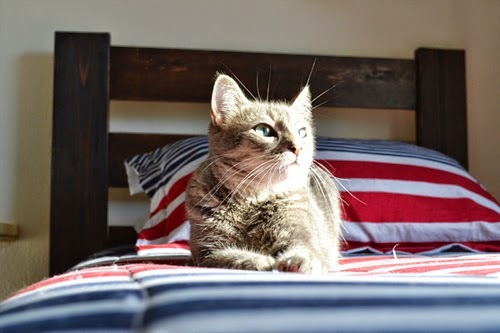 And in case you're wondering, this bed is totally cat approved. 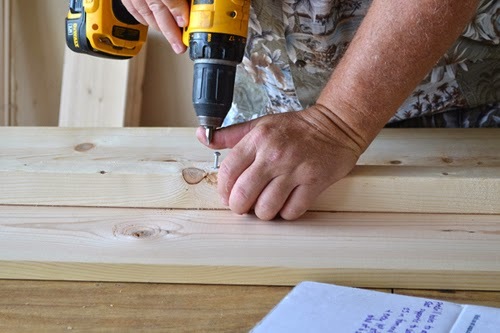 It may seem daunting but this is a totally doable project and you don't have to be a whiz with power tools either. The shape of the bed is basic and only uses straight cuts. If you can rock that saw and drill, you can totally swing this! I hope you loved this post and if you do, be sure to say hi at my own blog Dream a Little Bigger! Cool and very good directions. Wondering does this fit a regular twin mattress. Does the support underneath take the place of box springs? I just went and measured to be sure, and it turns out that my mattress is actually 2 inches more narrow and an inch shorter than a traditional twin size (though I'm not sure why). I'll update the post for dimensions for the traditionally sized mattress rather than my strangely slightly smaller version. 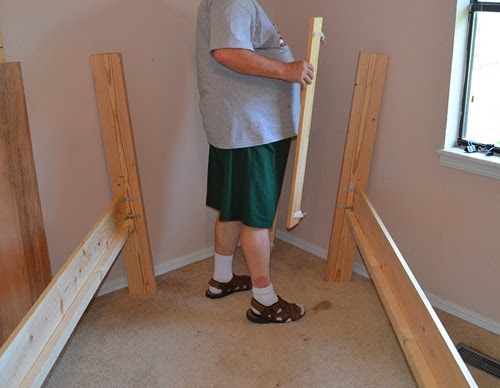 And the slats do take place of the box springs. They're comfy (been sleeping on the bed during renovation myself!) and cost around $70 less than a new box spring. I love this bed so much! 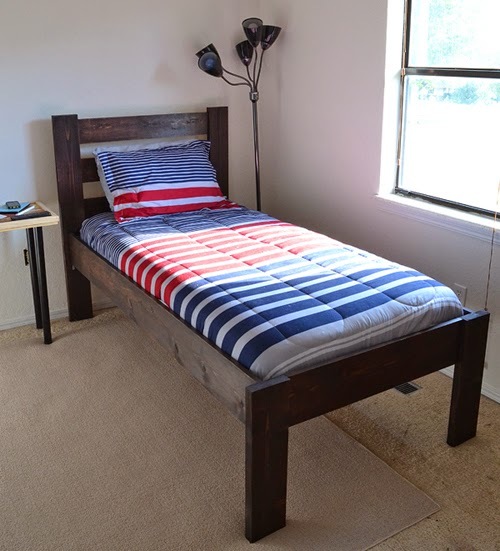 We are going to make our son (soon-to-be big brother) a twin bed and I am pretty sure this is the one! Thanks for the tutorial! That's so exciting. I hope he loves his new big boy bed! My local hardware store will cut the wood for me. So many cuts per day. Works great if you do not have a saw.